Posted in: Architect. Tagged: Cornelius A. Gower, J.H. Moores, James Henry Moores, L.D. Grosvenor, Lemuel Dwight Grosvenor. One day after walking my dog along the Lansing River Trail I ended up in Moores’ Park. I like to visit the park in the fall to look at the leaves, sit on the stands for the pool and just enjoy the view of river, park and the Eckert Power Plant. I know weird, but the Eckert Power Plant is an interesting structure to see, especially in the fading light of a late fall day. So, since I was in Moores Park, I decided to explore the homes that James Henry Moores owned in Lansing. It has been difficult to trace where J. H. Moores lived prior to the construction of the home at 303 W. Allegan. The 1873 Lansing City Directory listed a J Henry Mores as residing with Rev. J. Evarts Weed, east of Pennsylvania Avenue. Rev. Weed was the pastor for the First Presbyterian Church in Lansing for five years, 1865-1870 and then became a partner with J.H. Moores in his land business. Moores’ next residence was on Kalamazoo Street, the 1878 Lansing City Directory has Moores living on the southside of Kalamazoo, just east of Chestnut Street, no image of the house survives. The first home that we can identify with Moores, is the house he had built at 303 W. Allegan Street, across from the Capitol. A location that was one of the prime building sites in the city and Moores home did not disappoint. 303 W. Allegan, Lansing, MI. In this image the you can see the entrance on the side, the random pattern of the fieldstone foundation and if you look closely the third-floor porch on the tower. The magnificent an architecturally original home at 303 W. Allegan was designed by Jackson architect, Lemuel Dwight Grosvenor for James H. Moores in 1885-1885. Below is a description of the Moores’ home published from the State Republican in 1886. 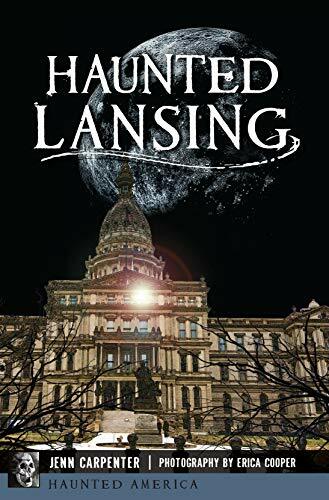 “Many handsome homes have been erected in Lansing this year, but by all odds the most striking exterior is that of Mr. J.H. Moores’ new residence, at the corner of Allegan and Townsend streets, which reached completion this week. The building is a novel combination of the Northern and Southern styles of architecture. The venture was a daring one, but it has proved successful and picturesque in the extreme. At the northwest [northeast] corner is a tower following many of the Norman lines; on the east side is an Oriental oriel tower; everywhere there are cosy [cozy] porches, odd little balconies and graceful angles. There are no weak sides to the structure. From whatever side or corner, it is viewed the effect is equally pleasing. The building is painted a rich dark red with dark olive-green trimmings, and the foundation walls, which are of fieldstone square but left rock-faced, are laid in a novel hit-or-miss pattern. The interior is probably the handsomest in the city. The front entrance at the side of the oriel tower connects with a large hall finished in cherry, and from this hall open the dining room, reception room, parlor and library. Wide sliding doors enable the family to instantly transform all these into a magnificent suite, and with the single exception of the library all are furnished with extremely handsome fireplaces. The dining room is finished in black walnut, the others in cherry, the fireplaces in the parlor and reception room have mohoganized cherry mantels with tile work and oxidized brass mountings. The windows are broad, low and deep. In the reception room a pretty bit of art in the shape of a small window of stained glass depicts Cupid amid the flowers. The pantry, kitchen, china closet, and the smaller rooms are finished in the natural color of the wood. The front stairway with its rich cherry mountings, occupies the oriel tower, a stained-glass window at the first landing adding materially to its attractive appearance. There are four large front chambers on the second floor, fitted with handsome fire places in rich marbleized slate and affording magnificent views of the city from their numerous windows. In the rear are the bathrooms and smaller sleeping rooms. This must have been a fascinating home to see in its prime, especially the interior. There is so much going on, architecturally it is overwhelming. A poor image of the Moores’ home. Note the two balconies on the facade and the Oriental oriel tower. I have no idea why this was described as an Oriental oriel tower? It is an oriel window. Note the hood over the front porch entrance, it resembles a witch’s cap normally seen on a tower, here it is a quartered segmented covering that many have served as an ornamental detail versus a functional one. In October of 1893, James exchanged his home at 303 W. Allegan for one at 501 S. Washington with Cornelius A. Gower. Why? Well it may have been a result of the Panic of 1893 which resulted in a 43% unemployment rate in Michigan. In 1893 there was a run on gold, yes, the USA was on the gold standard, when the Reading Railroad Company, yes, the one in Monopoly, went in to receivership triggering the run on gold. Over 500 banks closed, businesses failed, and farmers simply stopped farming. The result was a migration to cities by the rural poor. Detroit’s Mayor Hazen S. Pingree instituted a public works program in the city for the unemployed and created the Pingree’s Potato Patch, which allowed citizens to farm lots in the city. Seems like history always repeats itself. 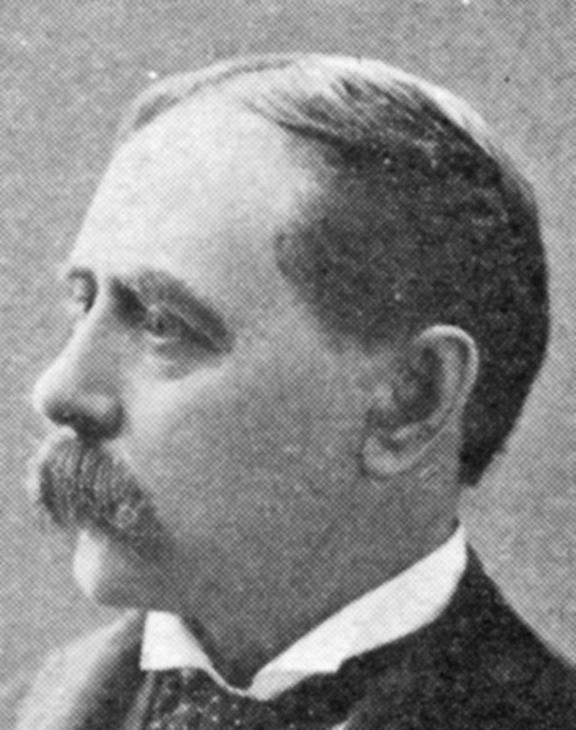 Turner, in his history of Ingham County suggested the Panic of 1896 as the reason for Moores’ financial ruin. The Panic of 1896 was for all practical purposes a continuation of the Panic of 1893. (Turner 573) No image of the Gower home at 501 S. Washington survives, the home on South Washington was torn down in 1890-1891 to erect the Glaister building. In the image you can see the roof cresting with finials across the roof’s ridge line. Does the front of the home seem unbalanced with the location of the porch on the side and the small windows under the second-floor and third-floor balconies? An enlargement of the facade of Moores’ home on Allegan Street. Note the third-floor balcony with its large supports and the spaced spindles on the balustrade, an element that is not up to code today. You can also observe the paintwork on the third-floor fish-scale siding, repeated on the face of the front gables. So, who was the man that J.H. Moores traded houses with. Cornelius A. Gower was born in Abbott, Maine on July 30, 1845, the son of Cornelius N. and Abigail (née Hawes) Gower. He attended Colby University in Waterville, Maine, and the University of Michigan where he graduated with a degree in Literature in 1867 and law in 1869. After graduation he accepted a position as principal of the public schools in Fenton and three years later became Superintendent of the Genesee County School system, a position he held until 1871. In 1871 he became Superintendent of the Saginaw Public Schools. In 1878 Gower was appointed the State Superintendent of Public Instruction, by Governor Croswell a posting Gower retained until 1881 when he became Superintendent of the Boys Industrial School, a situation he kept until 1892. After leaving the Boys Industrial School Gower served as Vice President of the Capitol Savings & Loan Company. On September 12, 1871 Cornelius married Miss Dora L. Walton in Fenton, Michigan, the couple had three children; Helen D., Charles A., and Clara A. Gower. Cornelius died at his residence in the Porter Apartments on Thursday, January 14, 1932. See LSJ 1/15/1932 and Portrait & Biographical Album 248. Coming soon. Moores’ financial recovery and his home at 500 Townsend. Posted in: Clubs, Lansing History. Tagged: HA. 19, Japanese Midget Submarine, Lansing Jaycees. In the early hours of December 7, 1941, the Japanese midget submarine, HA. 19 (I-24tou) was launched from its parent sub I-24 with the mission to penetrate the defenses of the United States naval base at Pearl Harbor and attack the warships at anchor. But the HA. 19 had a serious problem, it had a broken gyrocompass an instrument that was crucial for the navigation of the submarine. The submarine had a just two crew members, Ensign Kazuo Sakamaki and Chief Warrant Officer Kiyoshi Inagaki, they managed to maneuver their submarine to the entrance of Pearl Harbor but grounded the sub three times on a reef. The attack on Pearl Harbor was at its height at this time, the stricken submarine was spotted by the destroyer, USS Helm which blasted the sub off the reef but did not manage to sink the sub. Eventual the sub was disabled after it grounded on a different reef. At that point Sakamaki and Inagaki abandon the sub, Inagaki drown but Sakamaki managed to swim to shore and became the first enemy combatant captured by United States forces in WWII. Days later the submarine was dragged onto the shore by a tractor and eventually moved to Pearl Harbor. Note the side glass windows on the submarine, which allowed people who donated to the drive to view the interior of the sub. The Navy also placed two mannequins in the sub to represent the crew. Unfortunately, when the HA. 19 visited Lansing, the weather played a part in the viewing. There was rain throughout the day and threatening weather in the evening, which kept the number of visitors to about 4000. In the afternoon, the Boys’ Vocational School Band provided the music for the event, while in the evening the Army Air Corps band from Michigan State College played. The Jaycees raised $4475.25 for War Bonds that day. (LSJ 7/17/1943) To put that in perspective, when the sub visited the Washington D.C. area on April 3, 1943, $40,000 was raised in a little over 20 minutes with a total of $1,061,650 by the end of the day. See World War II Databasefor an explanation of the naming of Japanese midget submarines. For a full account of the role of HA. 19 see the article in Wikipedia, HA. 19 (Japanese Midget Submarine). The Erickson Power Station is located in Delta Township, is named after Claude Erickson. Posted in: Business, Lansing History. Tagged: James A. McPherson, Mystery, Western Beef and Provision Company. Every so often we are asked to identify images and try and determine just where the subject/building/home/etc., is located. The above photograph is an example of an image long identified with Lansing, in fact it appeared in two books on Lansing history. The problem is that neither book identified where the business in the photograph was located in Lansing. The first clue is in the top right-hand corner. It is the name of a physician, Dr. McPherson, the second clue is the number 73 below the window pane with Dr. McPherson’s name. So, we have a name and street address number, but not the street name. After reviewing the Michigan Gazetteersand census information all signs point to Dr. James A. McPherson, a well-known physician who practiced in Grand Rapids. We have a last name and street number. After searching the Lansing City Directories in the 1890s, we find no McPherson practicing medicine in Lansing in the 1890s. Why was the decade of the 1890s chosen? Well that is based upon the style of dress of the individuals in the photograph. Reviewing the Grand Rapids City Directories’ for the 1890s we know that Dr. McPherson’s office was located at 73 Canal Street in 1892 and 1893. However, this is not enough, we need corroboration. If you look closely in the above image, under the poultry you can barely make out the name of the company next door to Dr. McPherson’s office. The front of the awning the words ‘Wholesale and Retail’ appear, the rest is obscured. So, given that this was either a butcher shop or a commercial hide company, there are bear and deer carcass hanging in the windows, it had to be one of the two. The Grand Rapids City Directories’ for 1892 and 1893 listed the Western Beef and Provision Company at 71 Canal Street. Given all these factors it can be stated with a high degree of certainty that the image is from Grand Rapids and not Lansing. Of course, today there are a variety tools that can be used to aid in the identification of a photograph that were no available to earlier researchers. Now an image can be scanned, then changed to a negative and manipulated in a variety of ways that allow more information to be pulled from a photograph then was possible just 20 years ago. The researcher can also examine a wide range of City Directories and other sources electronically, while back in the day the authors of the books where these images were published could not. So, if you are willing to stretch the definition of Lost Lansing, this really is a loss for Lansing, but a gain for Grand Rapids.